Looking for ways you can display some of your favourite pieces or add interest to a room? A bookshelf is a surefire way to do just that! 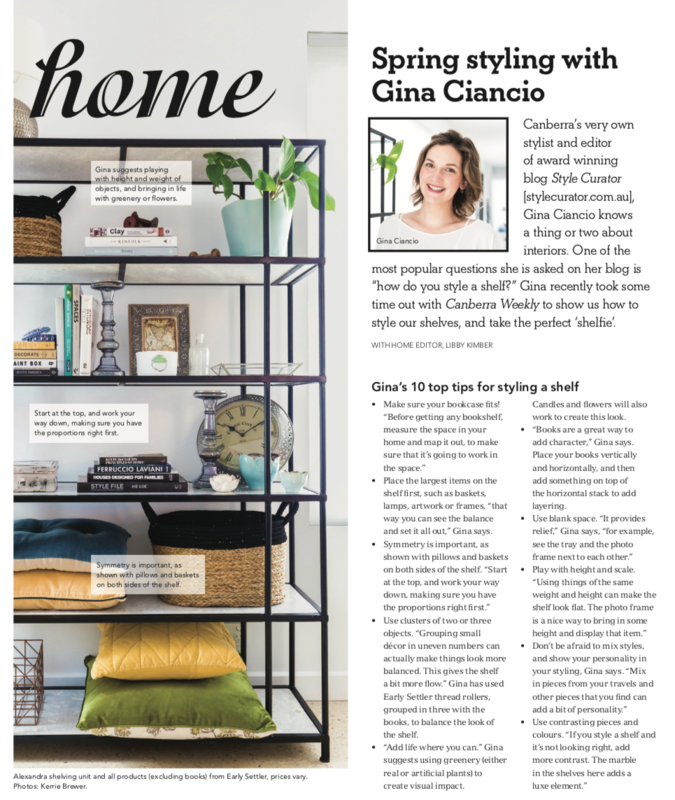 Recently I styled one of the beautiful limited edition Early Settler furniture pieces in my home — this black metal and marble bookcase from the Marbleous collection — for Canberra Weekly and offered my top shelf styling tips. 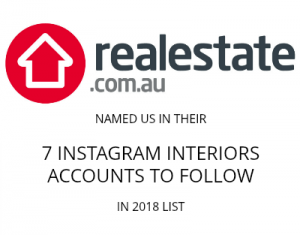 The magazine was available last week (scroll to the bottom of this post for the feature) but as our readers are based all over, I thought I’d share those tips on the blog too! 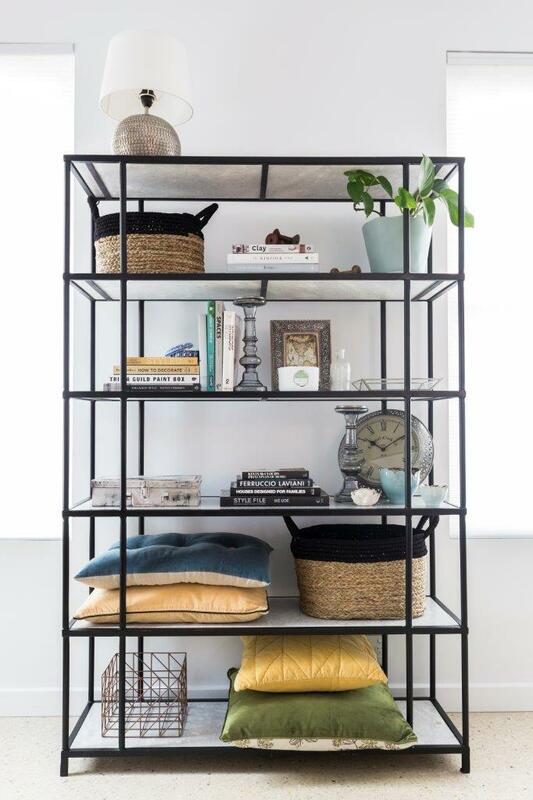 The first step to shelf styling is to find the right shelf for your space. 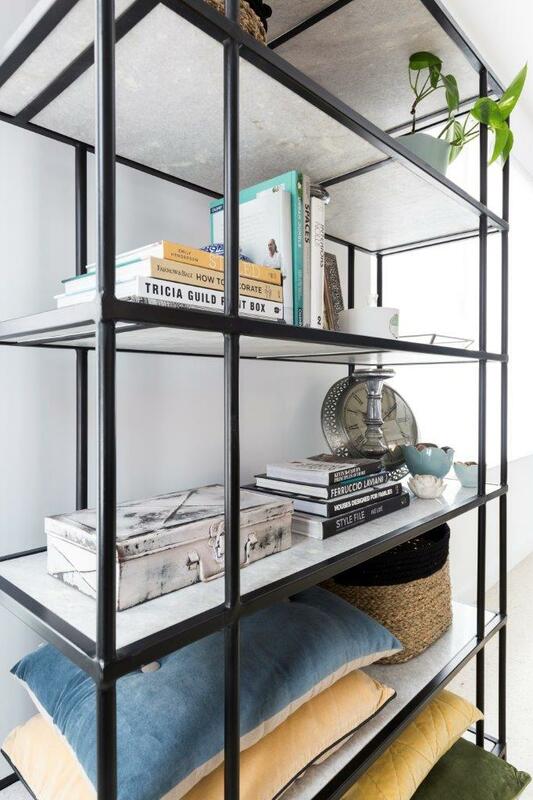 If you have a blank wall, a freestanding bookshelf such as the luxe piece I used offers maximum impact and as it isn’t fixed, you can move it to different rooms of your home over time or take it with you to your next house. Alternatively, a custom piece of cabinetry could be an option (this is what I used in my living room here) although these are far more expensive and require a professional to design and install. And if you’re short on space, one or two floating shelves could be the best solution for your home. Whatever shelving you decide upon, it’s important that you consider the scale of your space and get the size right. If it’s too large, it will overshadow the rest of the room and could restrict movement. And on the flipside, anything too small may look out of place and a bit ‘lost’. I always suggest measuring the space in your home and mapping out where new furniture will go with masking tape so you can be sure it’s going to work in the space. 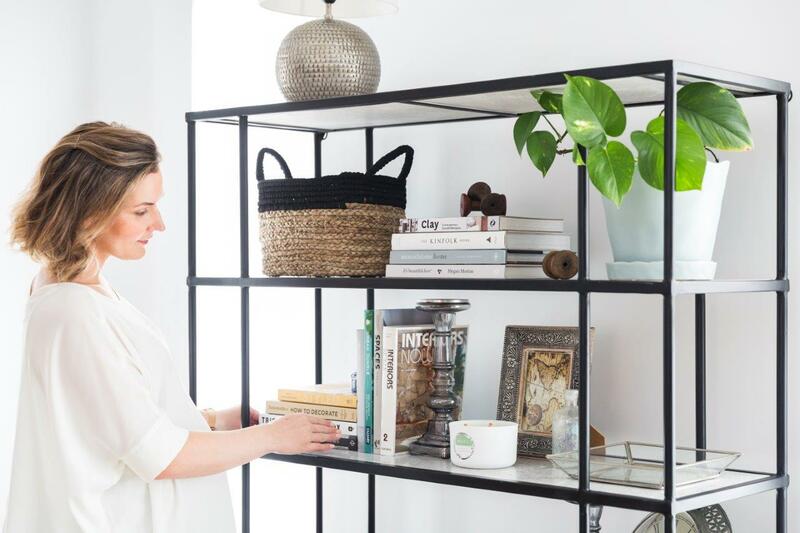 Begin styling a bookshelf with the largest items first — baskets, indoor plants, artwork and book stacks. That way you can see the balance and form the general layout which you’ll fill in with smaller decor. If you begin with small pieces, it’s easy to feel overwhelmed or that it just isn’t taking shape. To create balance in your shelf styling, I suggest using a little bit of symmetry. For example, you’ll see I used a stack of cushions on the lower shelf to the right and then on the shelf above, a stack of cushions to the left. Similarly, I used a woven basket on a lower shelf to the right and then on a high shelf to the left. Using this trick just once or twice will give your shelf styling the sense of equal weight and will be more pleasing to the eye. Just don’t go overboard, as if everything is symmetrical, you’ll create the illusion of columns and it may look a bit too rigid. Repetition is another styling trick that always enhances shelf styling. Grouping small decor in uneven numbers makes them look as though they belong — especially when you place them on a base such as a book or tray. For example, I used three timber spools from Early Settler on the top shelf and placed two of these on a stack of books. Of course, you knew this tip was going to be on the list! Indoor plants are my favourite way to add life to shelf styling and if you lack a green thumb, artificial plants offer the same visual impact. Other ideas include a vase a flowers, coral, or even candles can do the trick. Books are a great way to add character — they look great and can tell a story about your interests. Stack these horizontally and vertically, and I like to add something on top of horizontal stacks to add layering. You don’t need to fill your bookshelf entirely — in fact, some blank space will provide relief and enhance the look. If all the items on your shelf are the same weight and height, it can make the shelf look flat. Use some taller, slimmer items, such as the candle sticks, and offset these with lower and wider pieces such as the distressed metal box. Photo frames or artwork, clocks or lamps, are other ways you can bring height to your shelf styling. The beauty of shelf styling is the way it allows you to express your personality so don’t feel you have to use decor that fits a strict interior style. I love to mix new homewares with vintage finds, pieces you’ve collected on your travels or that have been passed onto you from other family members. And finally my top shelf styling tip is contrast! If you’ve used all the tips above and your shelf still doesn’t look right, chances are you need to add more contrast. Perhaps all the items you’ve used are metal or glass, and this is making your shelf styling feel cold? Injecting some natural materials such as woven baskets will soften the look. Big thanks to Canberra Weekly for the images and feature, and Early Settler for this fun collaboration opportunity!